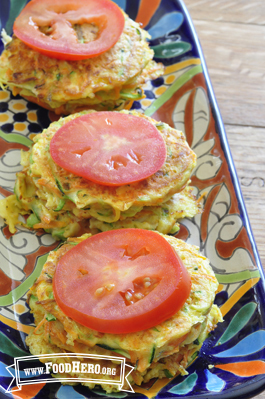 4 Comments for "Garden Vegetable Cakes"
Great recipe! I didn't have lemon so I omitted it and I already had some finely chopped celery and carrots so i use them, versus grating them. We did top with sour cream but also some dipped in BBQ sauce and soup. Next time i would love to try an asian sauce for dipping and keep trying new combos of veggies!! Update: still making these! Just tried a version with sweet potato and they were great, and great the next day too! I recently made this recipe for a Lunar New Years celebration at one of my K-8 schools. They were a hit! One of the parents told me that the texture reminded them of a Vietnamese dish called Banh Xeo. It's also great that this recipe is in Vietnamese in a previous Food Hero monthly! We made these all summer with whatever was in season at the Farmer's Market. One of our favorite combinations was grated zucchini and corn. I had extra zucchini and corn at the end of the summer and froze it. Just last week (late-November), I pulled out the frozen veggies and they made delicious veggie cakes! My toddler can be a little picky and he liked this! This recipe was so flavorful! The sweet potatos were a good choice. I ate mine with a little ketchup. Sour cream or salsa might be good as well. I might try these for breakfast, it would be a good way to eat a variety of vegetables in the morning!